Posted on March 23, 2011 at 12:38. At Hope Industrial Systems, we like to say “we sell industrial monitors and touch screens, and things to help you buy our monitors and touch screens.” This means we carry a variety of mounts, keyboards, screen protectors, cabling options and other accessories so that a customer can build a full custom workstation based on our displays and touch screens. Noticeably absent from this list is computers. While most of our customers connect our screens to some sort of PC, we at Hope Industrial do not sell PC’s because we believe that Tier 1 computer vendors, like Dell and HP, are better at making and supporting basic computers than we or any other industrial equipment manufacturers could ever be. There are a variety of reasons for this that we will save for another post. Long cables – using high quality cables, VGA video signals can easily be run up to 50′ with minimal distortion without using any boosters or converters. With a simple VGA signal amplifier, we can bump that up to 100′ (15.3m). When a touch screen is required, RS232/Serial cables can easily match this distance, or a simple USB-over-CATx extender can be used. For most users, this is an effective and inexpensive way to get the signals from the control room to the industrial touch screen. KVM Extenders – for distances all the way up to 1000′ (305m), we integrate KVM Extension technology from Adder, a global leader in KVM extenders and switches. These analog KVM extenders use standard and widely available CAT5/CAT5e cabling, which is cheap and easy to work with. For our Panel Mount Monitor customers, we offer a separate accessory mounting bracket that attaches to the rear of the monitor. A VESA adapter is shipped with every stand-alone KVM extender and allows the KVM remote unit to be attached to the accessory mounting bracket on the rear of the display. When a fully-enclosed Universal Mount Monitor is needed, the industrial KVM extender remote unit is housed in a rugged enclosure (available in NEMA 4 and 4X options) that is mounted to the rear of the display. 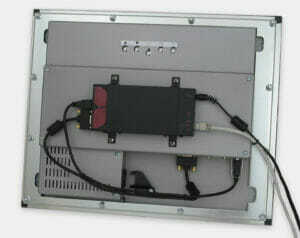 Finally, pedestal mount users can choose a simple KVM remote unit insert that fits inside any of our pedestal options. For more information on these products, visit our industrial KVM extender page.